Dave Tough actually got his start as a young child playing the Ondes Martenot with the 70s jazz rock outfit, Mahavishnu Orchestra. Although Eddie Van Halen gets the lion share of credit for popularizing the ‘two handed tapping technique’ on guitar, it’s been rumored that Dave began utilizing the same technique around the same time, albeit on his bass, resulting in a debate during the ’80s (amongst guitar geeks, at least) as to who was the true originator. 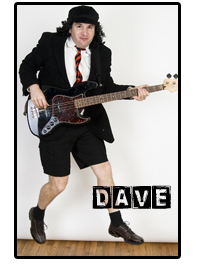 Dave’s true origins are unknown, yet several rumors persist. One states that he is the lost son of Peter North and Madonna. Another claims that he was begat by a union of stellar gasses in a distant galaxy.